State Sen. Jerry Hill tells KQED that he is looking into legislation that would break up the state's investor-owned utilities or make them public following reports that Pacific Gas & Electric and Southern California Edison equipment may have been connected to the Camp and Woolsey fires burning at either end of the state. "I'm very concerned about what we've learned so far regarding the fires of this year," Hill said, referring to reports filed by PG&E and Edison to state regulators about incidents at their facilities that occurred around the same time that these deadly and destructive fires began. On Thursday, PG&E told the California Public Utilities Commission that there was an outage on its 115-kilovolt Caribou-Palermo line at 6:15 a.m. Thursday. Cal Fire says the blaze started at 6:29 a.m. It's not clear from the report whether the damage occurred before or after the fire began, and a company spokesman did not address that question. But the location identified in the report appears to be very close to the spot where firefighters first encountered the blaze. At the other end of the state, Edison filed a similar report with the CPUC saying that a "disturbance" at one of its substations near the suspected Woolsey Fire ignition point caused an outage at 2:22 p.m. on Thursday, just two minutes before Cal Fire says the blaze began south of Simi Valley in Ventura County. Like PG&E and the Camp Fire, it's unclear if the outage at the Edison facility contributed to sparking the fire, if the fire caused the outage, or if they are unrelated. Investigators have yet to determine the causes of either fire, and both utilities say they are cooperating fully with the CPUC and Cal Fire. Hill has been a consistent critic of PG&E since 2010, when one of the utility's natural gas lines exploded in San Bruno, killing eight people in his district. The ensuing investigation found "a litany of failures" on the part of the utility in connection to the blast, and in 2017, a federal judge imposed a $3 million fine, five years probation and forced PG&E to run ads informing the public about its role in the explosion. On Sunday, he pointed to the results of Cal Fire investigations that say PG&E equipment ignited at least 16 wildfires last year as evidence that it might be time to crack down on the utilities. "At some point we have to say enough is enough," Hill said. "And I think we need to seriously look at whether an investor-owned utility model is good for California because the incentive is really the critical issue as I see it. Maybe when profits are the reason that you're doing your job, that creates a question especially in light of the safety aspect of it." 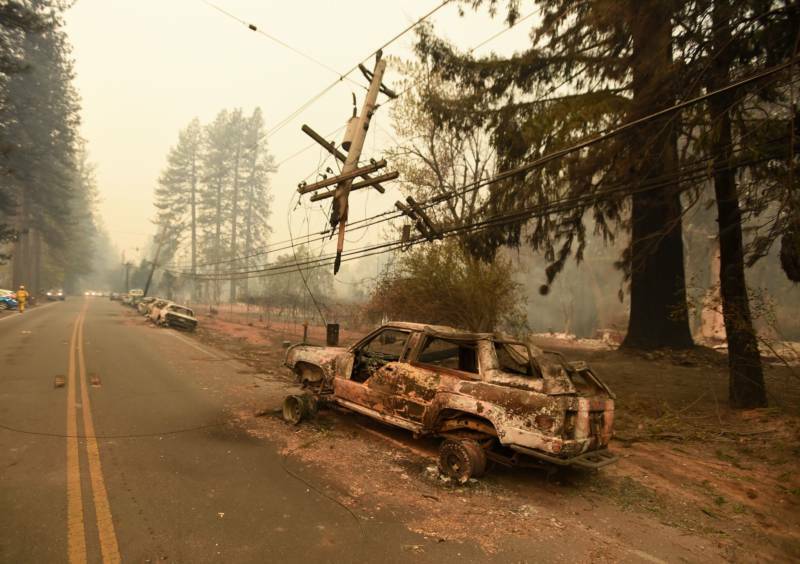 He also questioned why PG&E did not shut down power lines earlier this week like it did in several Northern California counties last month when there were similar high wind conditions that eventually led to the Camp Fire sparking on Thursday. "Was it because they were criticized for that?" Hill said. "But then they put the entire community at risk by not doing that. I think that the management of PG&E is incapable at this point in time of really operating a prudent and responsible utility." PG&E did not respond directly to Hill's comments. Earlier this year, Gov. Jerry Brown signed sweeping wildfire reform legislation, which included changes to wildfire liability laws that protect utilities from bearing the full financial burden when their equipment is found to have caused wildfires. The law allows utilities to issue bonds to help pay for their liability costs from 2017 fires and makes it possible for those costs to be passed on to ratepayers. It also set up a new system where starting next year, the CPUC can consider a broad range of factors in determining whether liability costs from future fires can be passed on to ratepayers. 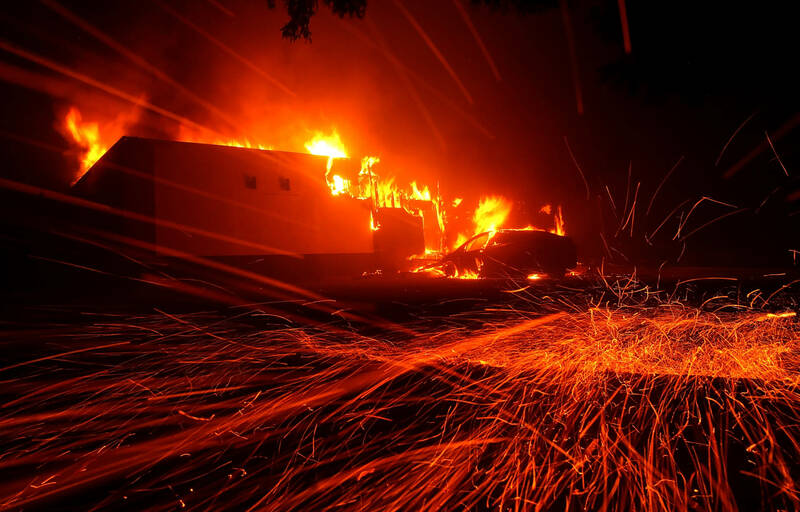 Critics of the law, including Hill, called it a "bailout" for utilities and said it rewarded their "bad behavior" in failing to invest more in prevention and safety measures, while opponents said it was necessary to ensure that the utilities were not bankrupted by liability costs in a world where climate change has increased the number and intensity of wildfires. "That was the concern last year from everyone that, 'Oh they can't go bankrupt,' as if that were the only alternative to changing their culture," Hill said. Hill said there may be more room to push back against utilities in Sacramento starting next year when Brown leaves office. Brown has often been seen as close with the utilities, and he supported efforts in Sacramento last year to mitigate the financial impact of wildfire liability on utilities. "I don't know what [Gov.-elect] Gavin Newsom's feelings are about PG&E, but I think Gov. Brown has a strong connection with them, and his comments to me early on last year were, 'Bankruptcy, we have to worry about bankruptcy,'" Hill said. At a press conference on Sunday afternoon, Brown didn't provide a straightforward answer when he was asked if the state needed to do more to hold investor-owned utilities accountable for their role in wildfires. "People are doing the best they can, but it's not good enough," Brown said. "We're going to have to do a lot more." Hill said he hasn't decided yet if he will actually propose legislation that would break up the utilities or make them public and acknowledged that even with Brown out of office, it likely wouldn't gain much traction in Sacramento. "Probably wouldn't get past the first committee, but at least it would start the conversation," he said. This post has been updated to include a response from PG&E and comments from Gov. Jerry Brown. KQED's Ted Goldberg and John Sepulvado contributed to this report.